There are situations in life that just call for slaw. I’m thinking any meal that involves bratwurst, is centered around fried items, or involves copious amounts of cheese. My sister invited me over for cheese fondue this past weekend and I was put on salad duty. It’s a strange fate to be dealt; normally when given dinner party salad responsibilities, I’d want to show off and make something flashy with gobs of blue cheese or rounds of melty goat cheese. But when cheese is already the star of the evening, you’ve got to regroup. You’ve got to eliminate any thoughts of dairy. You’ve got to go light, fresh, crisp, acidic. 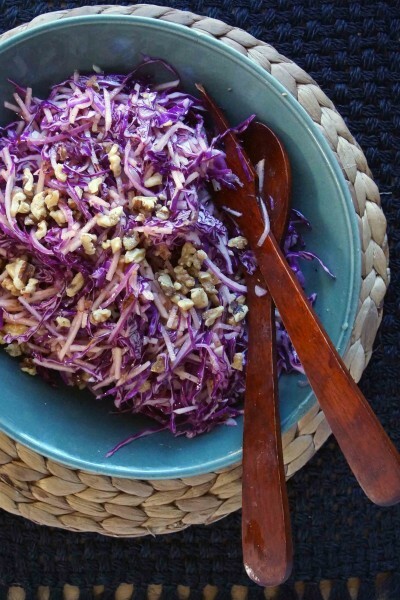 You’ve got to slaw! 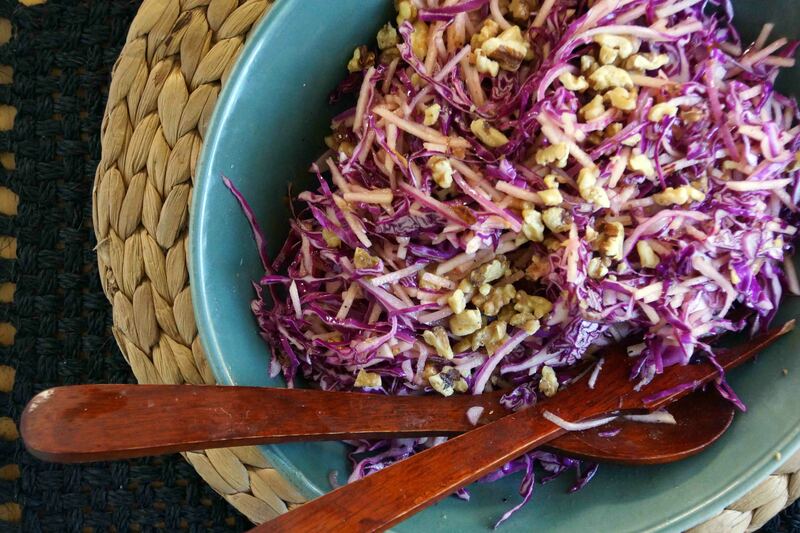 Seeing how we’re smack dab in the heart of fall, I opted for a red cabbage slaw with honeycrisp apples and toasted walnuts. It’s a refreshing counterpoint to rich dishes. It’s simple, it’s pretty, and I think it’d be a hit at any fall dinner. Ready? Set? Let’s make some slaw! 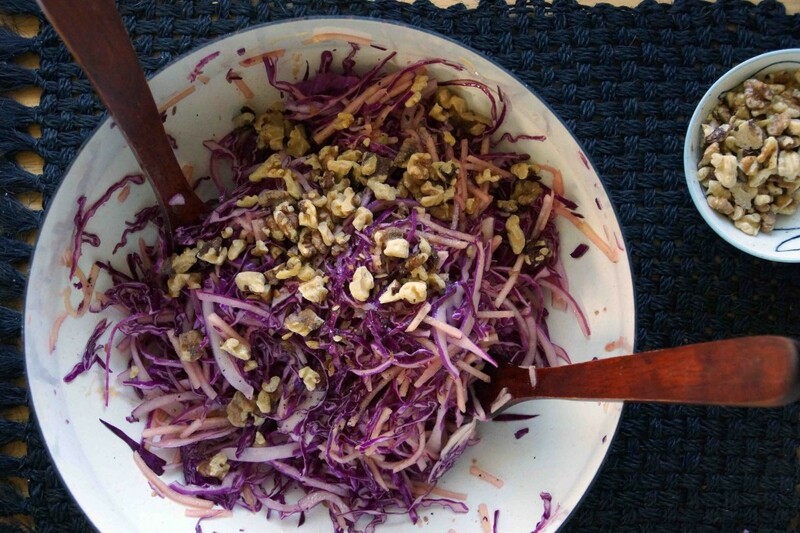 Gather your ingredients: cabbage, apples, red onion, and walnuts. Red cabbage always blows me away…those dark purple leaves are so beautiful. You’ll need some Dijon mustard, cider vinegar, and olive oil, too. 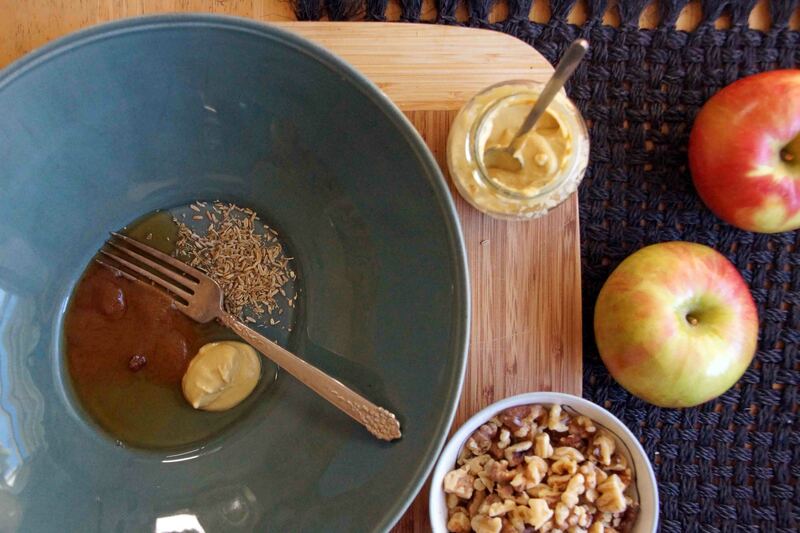 First, we’ll whisk together some apple cider vinegar with Dijon mustard, fennel seeds, brown sugar, salt, and pepper. Sweet, salty, tangy, with a mustard bite…nothin’ wrong with that. Julienne a couple of apples and toss them in the bowl with the vinegar. Man, my mandoline is getting a workout this fall! 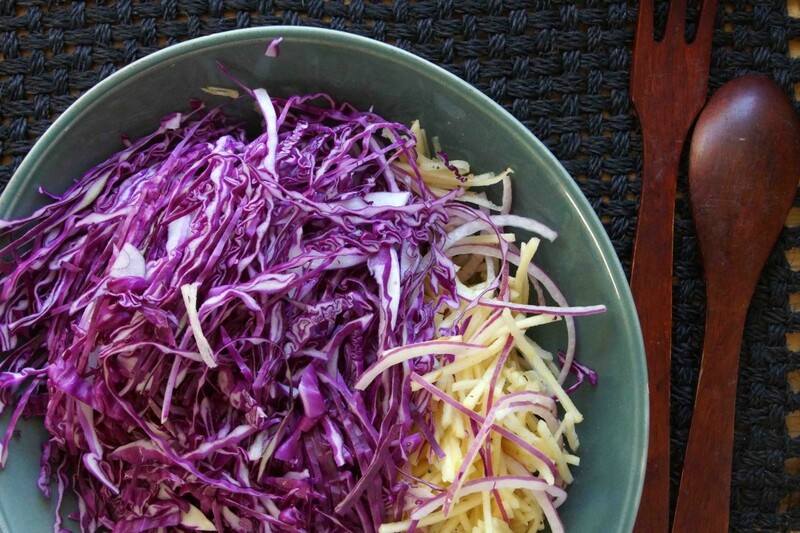 Thinly slice the red cabbage and onion and add it to the mix. If you’re anything like me, this is the point when you realize you started with a bowl that’s way too small. Transfer it to a larger bowl, drizzle in some olive oil, add a sprinkle of salt and pepper, and give it a good toss. And there you go; you have slawed. Mound it up beside a pot of melted cheese or a plate of wurst or schnitzel and love every crisp, crunchy bite. 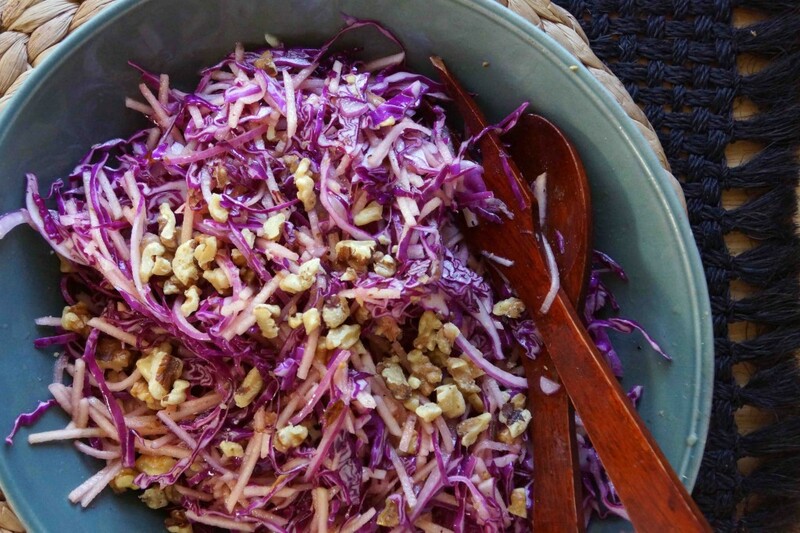 I love serving a crisp, refreshing slaw with cheese or meat-heavy main courses. This one is perfect for fall gatherings. 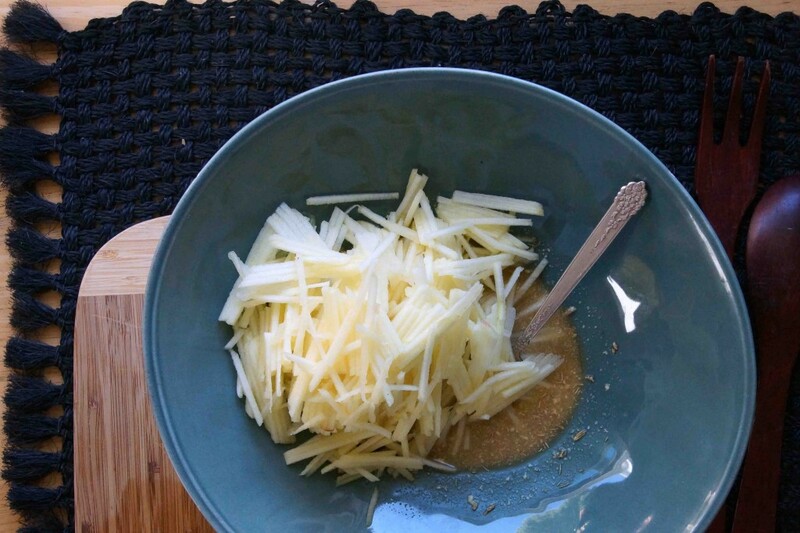 Combine vinegar, sugar, fennel, and mustard in a very large bowl. Whisk to combine, season with salt and black pepper. Peel and julienne the apples. Toss the apple "sticks" in the vinegar mixture. The acid will prevent them from browning while you prepare the remaining ingredients. Cut the cabbage half in half. Remove the core and slice the cabbage, crosswise, into very thin strips. Add to bowl, along with the onion. Toss to combine. Add olive oil and toss to coat. Taste. Season with salt and freshly ground black pepper. Add the walnuts and toss once more. I like slaws served cold, so I'd recommend refrigerating the slaw for an hour or so before serving. 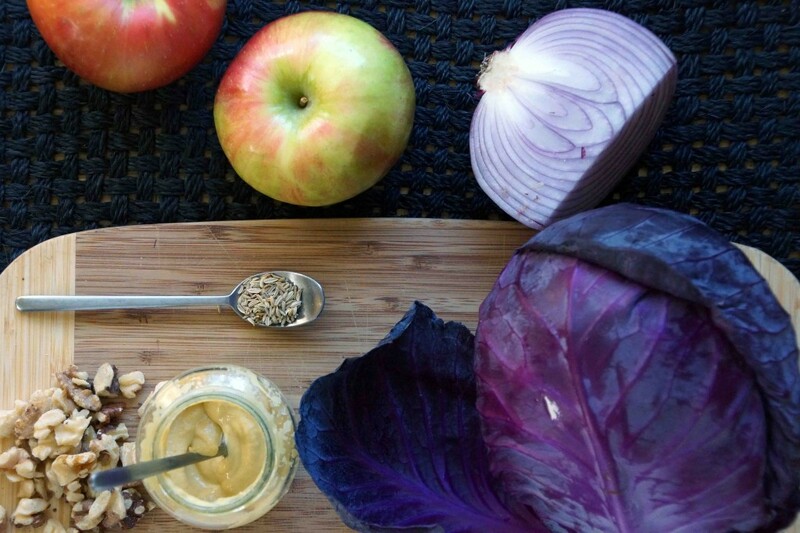 apples and red cabbage are two of my favorite ingredients – and such pretty colors!! Healthy and tasty. Just great. Thanks for sharing. I made this last night for a party and it was fantastic! Thank you for this great recipe, it’s a keeper. I made this salad twice for Christmas 2015, and made it again this morning. 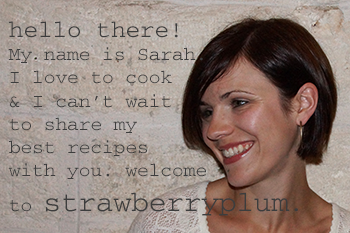 Hands down my favourite salad to make and eat – and I get so many comments from family and friends!